The wireless, digital, hand-held remote puts control of the RazorX Longboard’s kick-to-start, 125-watt motor in the palm of your hand. 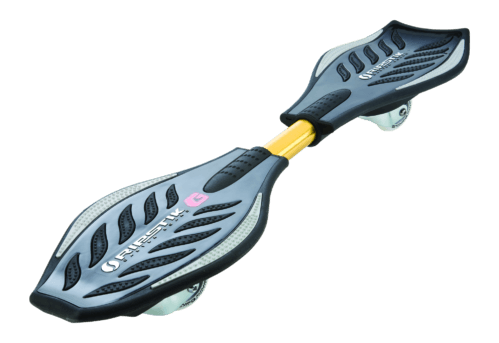 Variable-speed control helps ease you in and out of the longboarding action, allowing riders to increase and decrease their ride speed at any time by pushing forward or pulling back on the control stick. The RazorX Longboard gives the traditional longboard a jolt, amping up the action with its electricpowered, carve-and-cruise ride. Get the action started with the variable-speed, wireless, digital, handheld remote and let the kick-to-start, 125-watt, geared, rear-wheel-drive motor keep you cruising at speeds up to 10 mph (16 km/h) for up to 40 minutes of continuous use. Step on and take off with an electric zip that will take your ride to new lengths. The RazorX Longboard is electrifying the longboard scene, amping up the carve-and-cruise action with an innovative, 125-watt, geared, rear-wheel-drive motor made to go the distance. This complete longboard uses a lithium-ion battery to deliver extra zip for your longboarding fun. The 37.5 (952.5 mm) long, 5-ply bamboo deck and custom, reverse kingpin trucks deliver a smooth, responsive ride, while perforated grip tape and ground-gripping urethane wheels keep you firmly in control of your board. Our new geared, rear-wheel-drive motor technology is virtually maintenance free, meaning it eliminates alignment issues, chain or belt. The RazorX Longboard is powered by a kick-to-start, 125-watt, geared, rear-wheel-drive motor and a lithium-ion battery that delivers an electrifying skateboarding ride at speeds up to 10 mph (16 km/h) for up to 40 minutes of continuous use. The 37.5” (952.5 mm) long deck is made of high-quality, 5-ply bamboo and features perforated grip tape to provide a smooth, controlled ride. The RazorX Longboard comes pre-assembled, so you’re ready to ride this complete longboard electric skateboard right out of the box. Includes a wireless (2.4 GHz), hand-held, digital remote with wrist strap (replaceable) and 22V lithium-ion rechargeable and replaceable battery pack. Additional features include ground-gripping urethane wheels and custom, reverse kingpin trucks for enhanced turning, perforated grip tape and geared, rear-wheel-drive motor that eliminates alignment issues, chain or belt. There are no reviews yet. Be the first to leave a guest review.